Microscopic description: This tumor is very cellular with loosely cohesive and discohesive single cells. 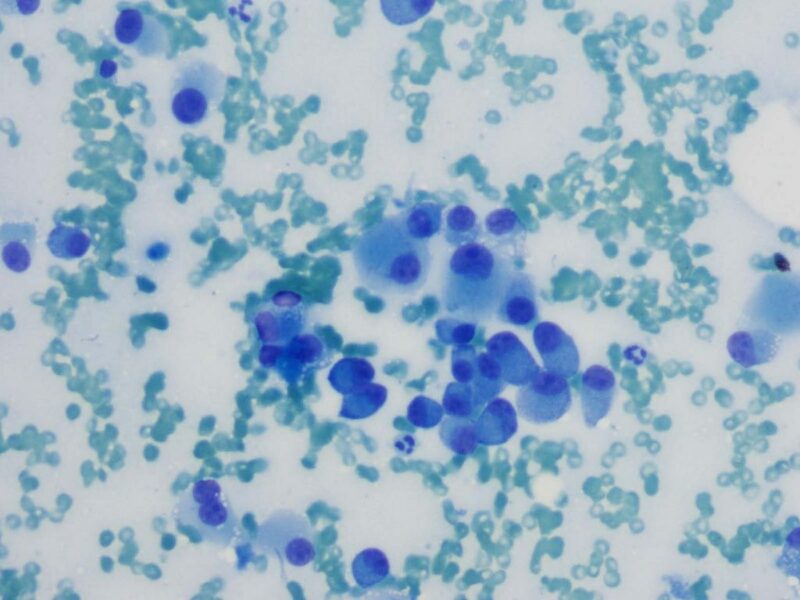 The neoplastic cells in this particular specimen are plasmacytoid. The eccentric nuclei exhibit anisonucleosis, but little pleomorphism. There are prominent nucleoli present as well as some binucleated and multinucleated cells. The cytoplasm is abundant, granular to foamy, with scattered vacuolization. 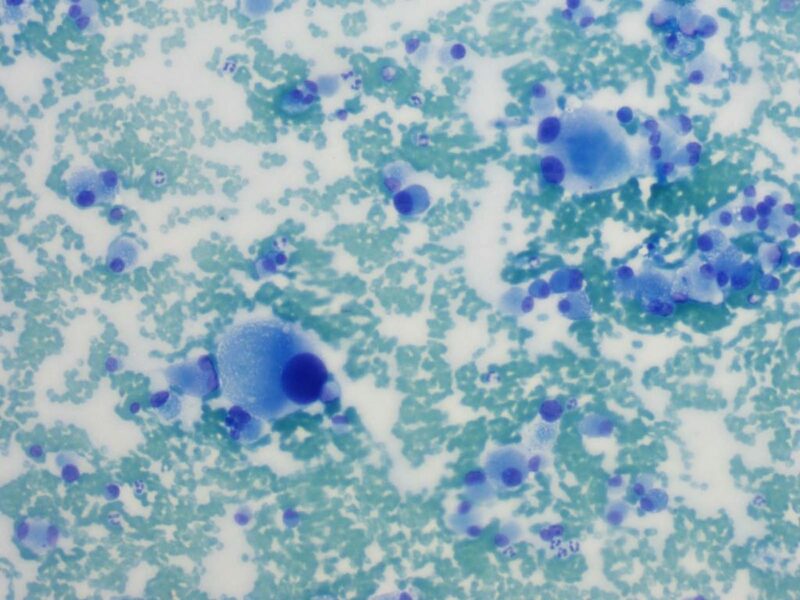 Most of the cells are oncocytic in appearance and this particular case may represent a rare oncocytic variant of adrenocortical carcinoma, however that diagnosis should be reserved for a resected tumor. Most adrenocortical carcinomas have multiple mitotic figures, some with atypia. 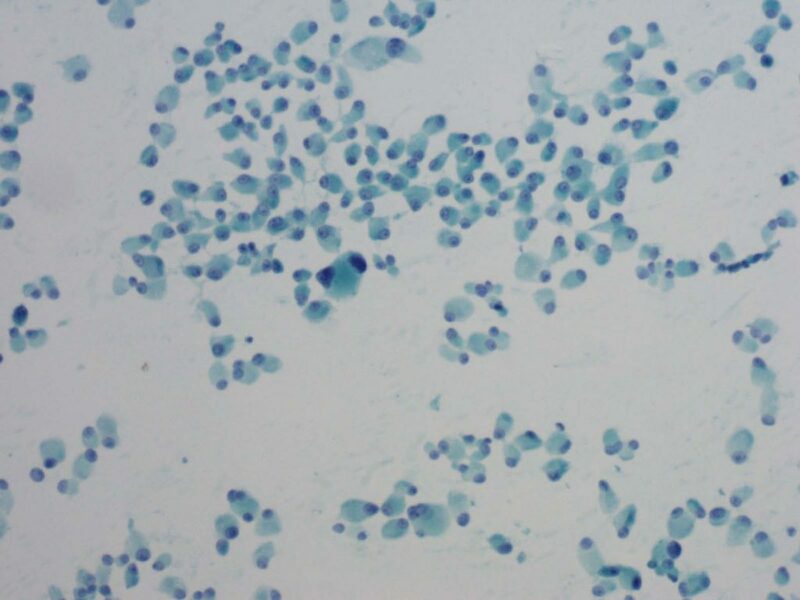 This particular case did not have any identifiable mitotic figures. 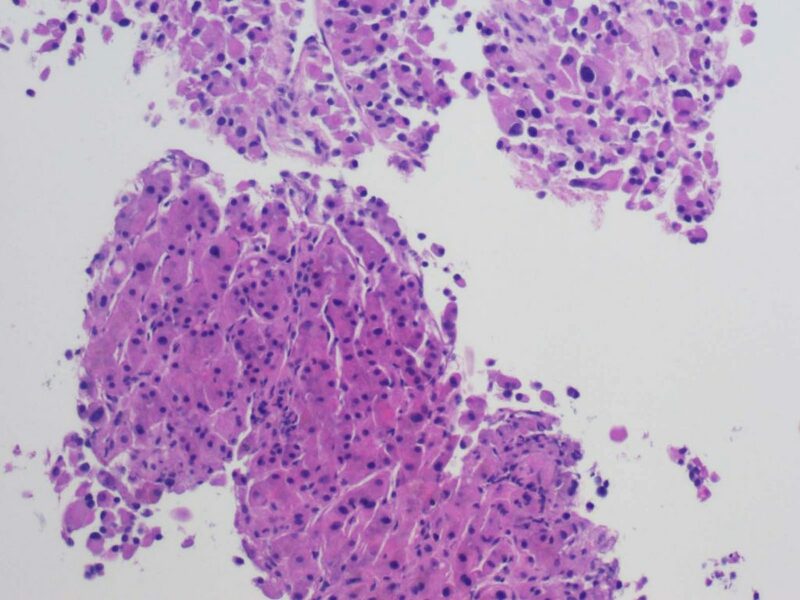 The key to identifying a malignant process in this case was the large size of the adrenal mass (16cm), multiple liver and lung metastases, as well as the presence of necrosis identified on imaging and in the core biopsies. 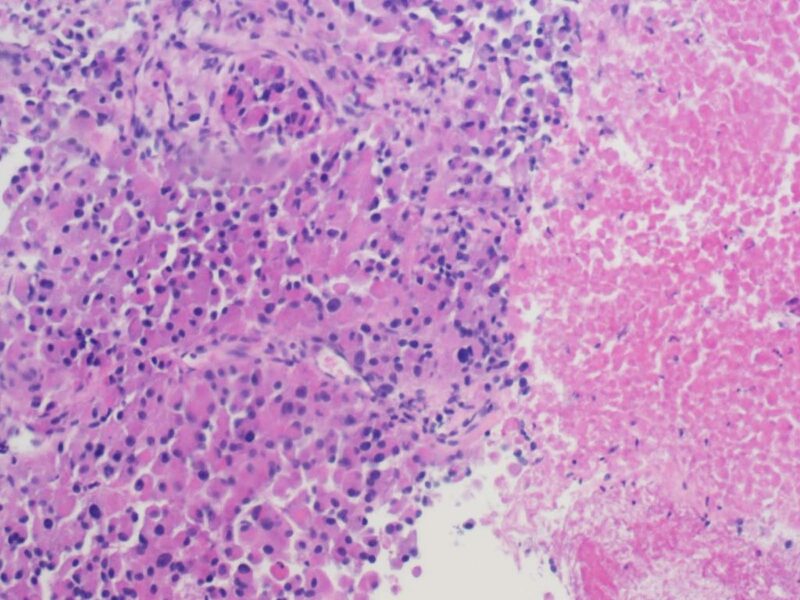 Differential Diagnosis: The plasmacytoid nature of these cells raised the differential of a neuroendocrine lesion, such as a malignant pheochromocytoma, as well as melanoma. Melanoma was further considered due to the multiple binucleated cells. Hepatocellular carcinoma and renal cell carcinoma were also in the differential. Immunostains and imaging studies were helpful. A single large adrenal mass with multiple smaller liver and lung lesions supported an adrenal primary. Adrenocortical carcinomas are positive for Inhibin, Melan-A, Steroid Factor-1, and variably positive for neuroendocrine markers such as synaptophysin and INSM1 as well as cytokeratins. We differentiated this tumor by a panel which resulted in positive staining for Inhibin-A, SF-1, and weak staining for AE1/AE3 and INSM1 (neuroendocrine marker). The tumor cells were negative for renal marker Pax8, chromogranin, liver marker Hepar1, Sox10, and S100.